Sometimes we can surprise ourselves by the way we act or the things we say. I’ve been surprised a lot lately by my own attitude problems. Each day, I’ve been fighting through it in my prayer time, pressing through until I know I have the victory, but then the next day I find myself right back in that same place again, so the whole process starts all over again. After a few days of that, it got to the point where it was hurting my confidence before God, making me think I must be way off the mark. How can God accept such a mess? That’s where I was again earlier today, but again I pressed through it until I entered the secret place where I knew all was well, but this time, the Holy Spirit turned it around, so instead of hurting my faith, I was encouraged because He showed me it was all part of His purification process through which He is making His people into weapons of war, ready to fight in the great battles ahead. I saw it was like the way metal is purified in a furnace when making a sword. 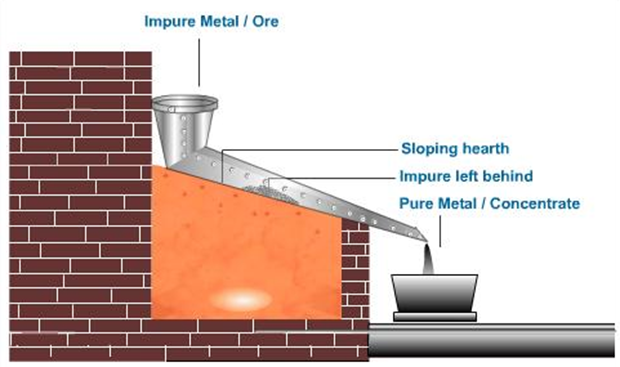 Intense heat is applied to separate all the impurities so only the pure metal remains, as shown in this diagram. Only the pure metal is used to make the sword. Then it’s polished until it shines brightly, reflecting the light. 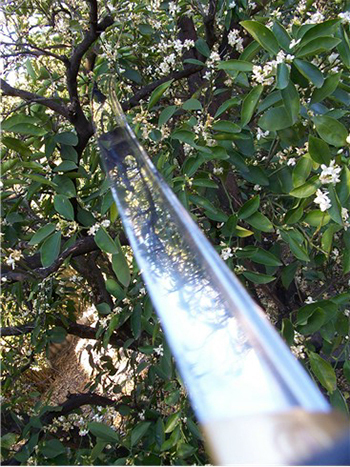 A finished sword can even appear transparent because it so clearly reflects the light, like the one shown here. 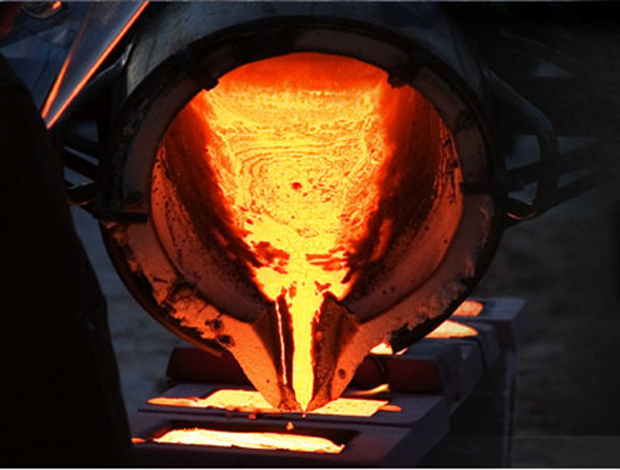 Like the sword, our refining process begins with the fiery furnace. Trials and afflictions force the ugly impurities in our heart to separate and rise to the surface so we can confess them and give them to God, which gives Him our permission to remove them from us, leaving only our pure devotion for Him. Of course, I never get answers to those kind of stupid questions. He waits for me to finish and humble myself so we can move on. Today, He really ministered to me through the 13-minute audio recording below, which is Laura Hackett singing one of the most beautiful worship songs I’ve ever heard, Jesus You Make Me Pure. the closer we get to the light, the more our flaws and imperfections show. Spot on Christine…..It’s my prayer the Lord will perfect that which concerns us in this season. Purity and holiness has been my prayer from when I was little. Had not thought of that!!! Nothing can be hidden from the light! Amen James. I have been feeling the same way and wondering why I couldn’t shake the feeling, why it kept reoccurring. I’m glad to know I’m not the only one experiencing this. I believe you are correct, and thank you for posting this as I also found myself with an attitude that I wasn’t sure why I felt that way. Purify me oh Lord, cleanse me through fiery trials so that you may strengthen me. Yep…me to. For the last 6 weeks I have been fighting backsliding. I feel like I have made a stand this past week and heading in the right direction again. This aligns perfectly with your article. The Lord sees what we will become despite the state we are in today. Wow Elijah, last night i had a dream where I(at least i think it was me, kind of a blur) was a holding a huge sword and i remember a voice saying words, although the only words i clearly remember are “children of men”. But in my Spirit i knew the theme of the dream. The theme was that i have a sword, i am equipped, but i need to believe that what the Lord has equipped me with is in fact exactly what i need to fight the good fight. I’ve been ex-communicated from my church about a week ago because of this tool the Lord has given me so i’ve been very doubtful about it and ashamed of it. But the Lord has shown me that it’s not something to shy away from. It’s something that is “outside the box”, one of the very things James Bailey spoke about in his earlier posts about God showing up in new ways we’ve never thought of. And after obeying the Lord today and refusing to be ashamed of it. I closed my eyes for about 5 minutes and saw the word “Pastor” being changed into “Past Door”. Which to me translates into “out with the old and in with the new”. Which lines up with a lot of what the saints here are hearing from the Lord. That he will show us new things we knew not. He who has an ear, let him hear! Amen. Thank you for reminding me, Elijah!! Awhile back (several months), I dreamed that I was in a room (my bedroom?). I seemed to be preparing (for battle?) and my step daughter drove up to the window & asked me to give her a sword! I had 2!! One small one a bit larger than a dagger type. And a huge one on the wall that was beautifully decorated with jewels, gold and glistened!! She asked for the big one but I said ‘oh no, I need that one to battle’ (I sensed that I meant “for The Lord”), so I handed her the smaller one through the window!! That is one of my sincerest desires is to battle for The Lord!! To God be The Glory!! May all on z3 be abundantly blessed and covered by the Blood of Jesus Christ!! <3 you all. Thanks for sharing that confirmation Elijah. This message is for me too. This last week especially I have been so quick to irritation. It is really a daily battle that I’ve been feeling like a failure at. James, to add to your analogy of the refining fire, I learned that the samurai of Japan would make their swords more resilient and stronger by beating it with hammer blow after hammer blow. The more beating of the metal refined it to the point their swords would break any sword it was swung against. That is interesting Thomas. Please remind me not to have a sword fight with a Samurai. St. Paul said he was the least of the apostles because he had persecuted the church. They say he wrote approximately 2/3 of the New Testament–this least of the apostles. What is more fetching than true humility? Thanks, James. This is me to a T these days, wow, I needed to hear this! I feel part of the family with this incredible struggle with being refined. At least I sure HOPE that’s what the LORD is doing with me, because it’s a pretty blank canvas with some messed up scribbles on it if not. To God be the glory forever and ever, Amen! I understand. I have these same struggles DAILY as well. I fully grasp it when I’m finished with good prayer but as Im going through the day I just start doubting myself. I have to lift it up to God. ( My marital situation continues to be difficult but rather than leaving, he does not know what he wants to do. But he certainly isn’t acting like he wants to be married to and love me. So daily I struggle with this but when I pray for help, enlightenment, and a conversion for him, I continually hear “patience and perseverance”. it’s almost as if I am just waiting something in our world/lives to happen that will change everything and there is nothing I can do in the meantime, except exude Christ’s love.) I look forward to listening to the music tomorrow on my way to work. I’m leaving you to the verses I was led to tonight. 2 Peter 5:5-11 5 And beside this, giving all diligence, add to your faith virtue; and to virtue knowledge; 6 And to knowledge temperance; and to temperance patience; and to patience godliness; 7 And to godliness brotherly kindness; and to brotherly kindness charity. 8 For if these things be in you, and abound, they make you that ye shall neither be barren nor unfruitful in the knowledge of our Lord Jesus Christ. 9 But he that lacketh these things is blind, and cannot see afar off, and hath forgotten that he was purged from his old sins. 10 Wherefore the rather, brethren, give diligence to make your calling and election sure: for if ye do these things, ye shall never fall: 11 For so an entrance shall be ministered unto you abundantly into the everlasting kingdom of our Lord and Saviour Jesus Christ. Sara, I too know the lonely feeling. It is hard when our partner does not understand our relationship with our Father. For me it seems like a tug of war. When I feeling pushed away from my husband, I press more into my Jesus. This causes even more separation from my husband which presses me more toward Jesus. I guess that is why paul said that it was better not to be married. I too keep waiting for the moment that my husband has to be driven to separate from this flesh and the worldly things. For now, it truly is a lonely house. Hang in there sister. Our true groom is coming for us soon. Thanks for sharing that SaraM. I’m glad you’re hanging in there. God bless you and your husband. Most of us can thank you for this. We know that feeling and uplifting to know others also struggle persevere and receive victory at the end. Thanks so much for posting this. God’s been trying to reach me for a long time. I struggle daily with my sinful nature. I can certainly identify with what you’ve shared here. He NEVER gives up, that I can be assured of. His relentless pursuit is so obvious. I pray that each of you who reads this post will be encouraged as I have been. God is good ALL the time.